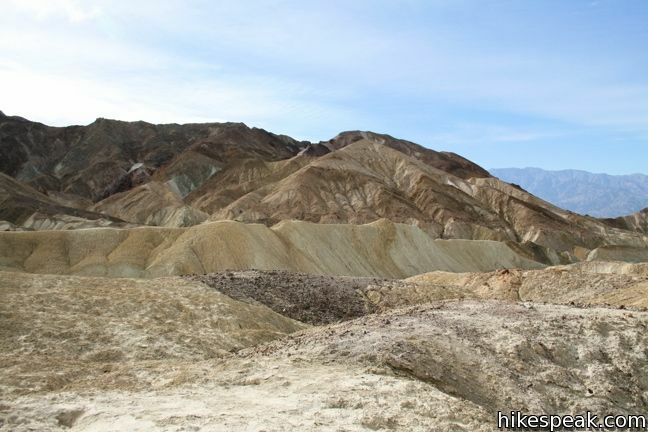 Golden Canyon – Gower Gulch Loop visits some of the most stunning landscapes in Death Valley National Park. 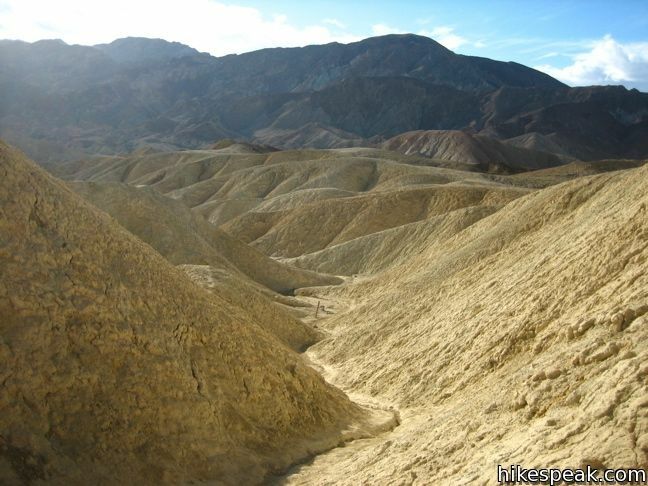 The 4-mile hike begins with a one-mile trek up Golden Canyon. Numbered markers along the way make the canyon easy to follow. These markers correspond with an interpretive trail guide that tells the geological history of the land. The guide is available for purchase at the trailhead and visitor centers, but no guide is required to realize the beauty of Golden Canyon. 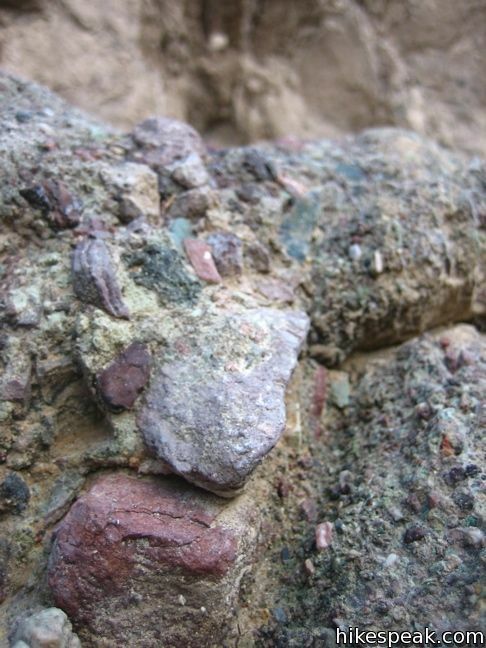 The sides of the canyon are made up of red mudstone and colorful mosaic conglomerates. Occasional broken pavement offers a reminder that a road once went through this canyon until a rainstorm took it out in 1976. 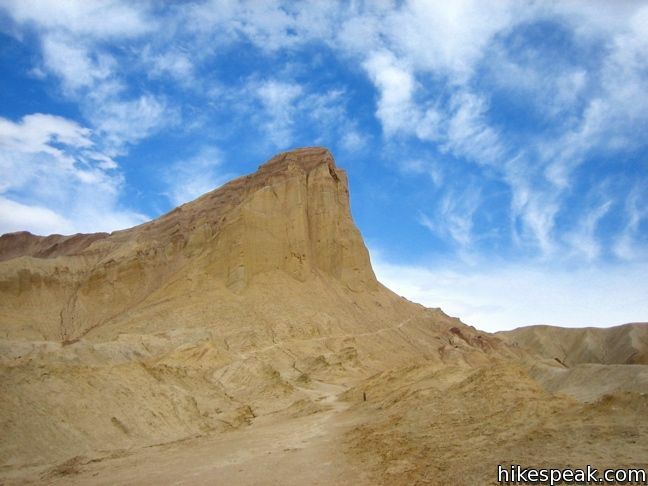 Follow the main wash uphill toward the prominent landmark aptly named the Red Cathedral. 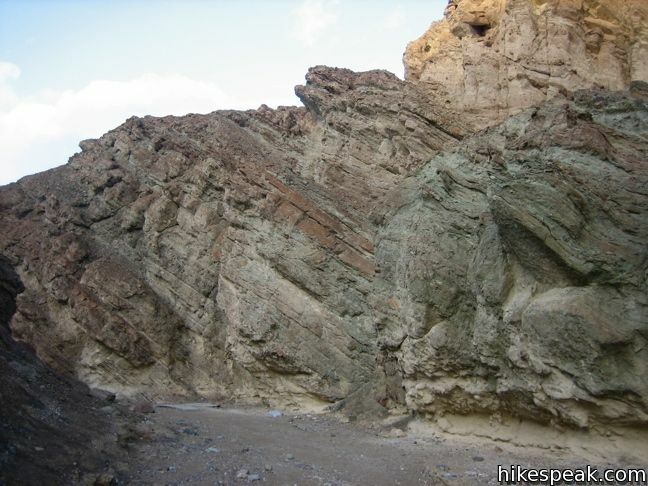 Several small canyons break off from the main channel, begging to be explored. Answering that call is the hiker’s prerogative. One mile into the hike, near marker #10, the loop leaves Golden Canyon. Follow the brown arrow pointing to the right and hike out of the canyon on a footpath that passes just beneath a prominence named Manly Beacon. 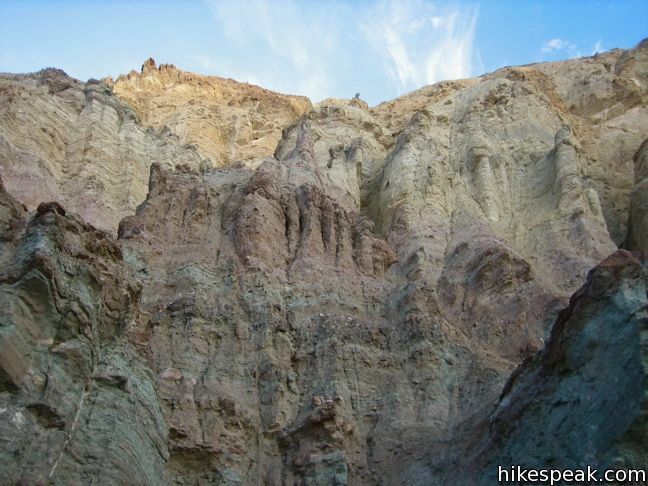 As a side trek, hikers may continue ¼ mile up Golden Canyon to the base of Red Cathedral. The single-track beneath Manly Beacon provides some of the finest views of the loop. 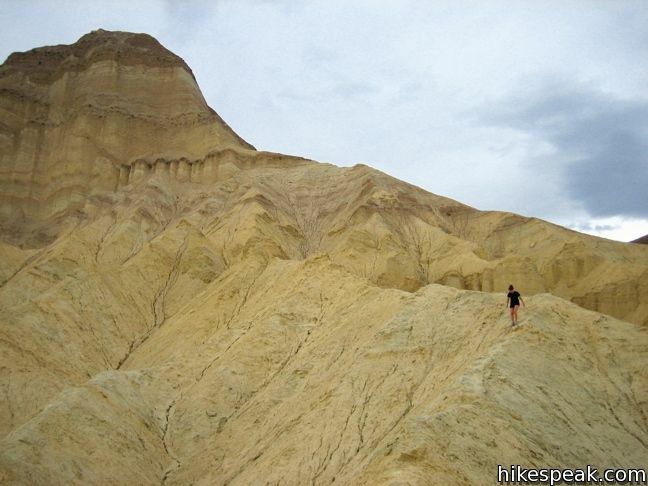 At the high point of the divide, hikers can enjoy a mesmerizing panorama across the badlands. 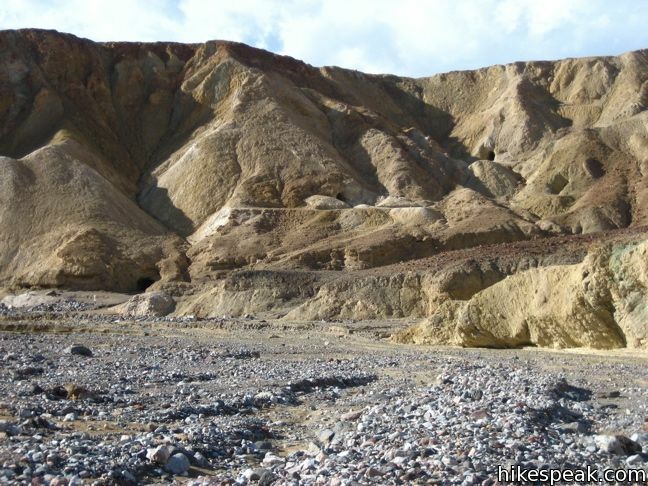 Beyond Manly Beacon, the trail descends mudstone slopes into Gower Gulch. The path breaks up a bit, allowing hiker to plot their own course down to the wash. 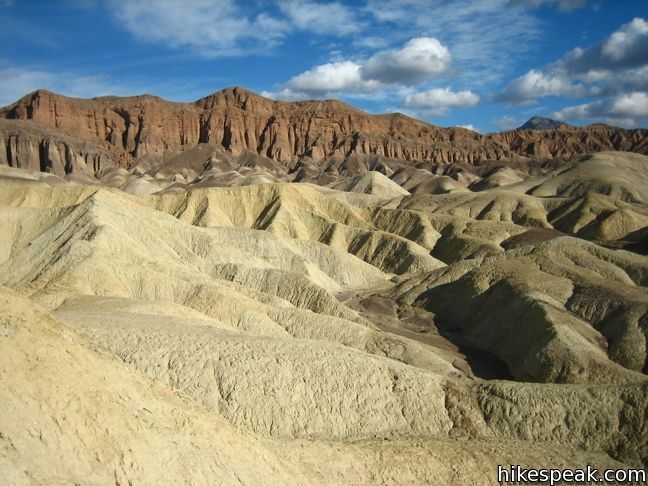 The badlands region is quite interesting to explore, and getting lost is difficult as all ways downhill lead to Gower Gulch. 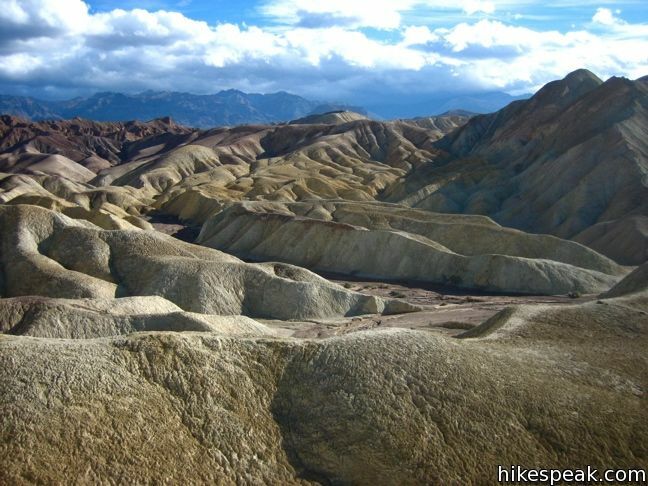 A variation on this loop is to turn up Gower Gulch and follow the Badlands Trail to Zabriskie Point, a scenic overlook along Highway 190. 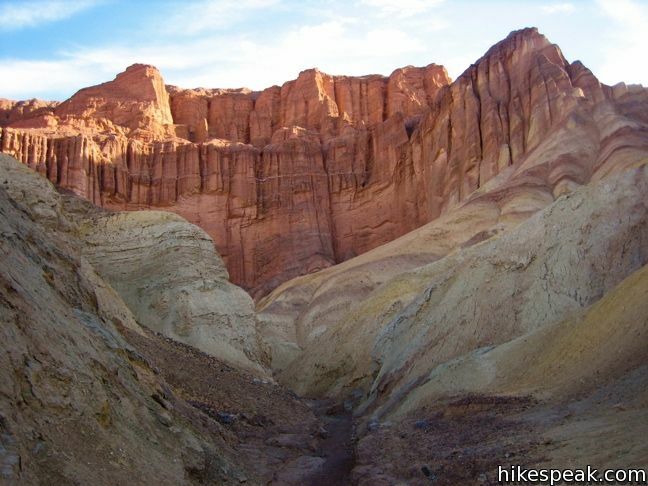 This can be used as an extraction point for those with a vehicle at that trailhead, or as an extension of the Golden Canyon – Gower Gulch loop to see more of this impressive environment. 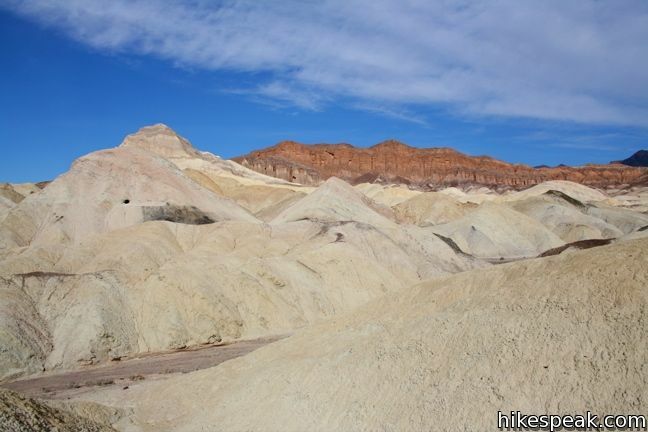 Gower Gulch has no interpretive markers and less of a trail. 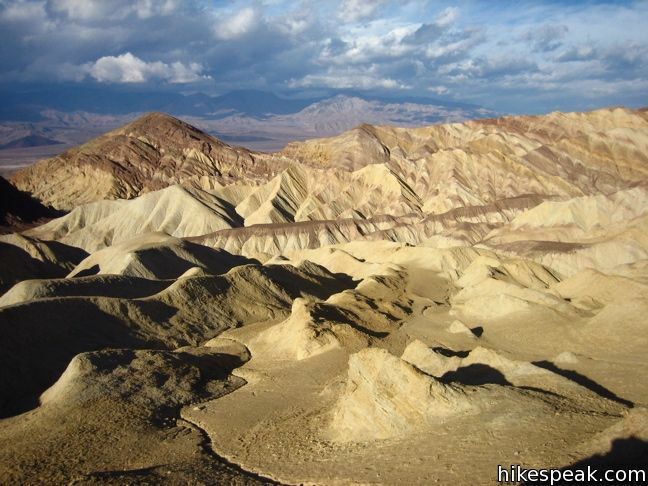 Simply follow the wash as it winds downhill and out of the mountains. 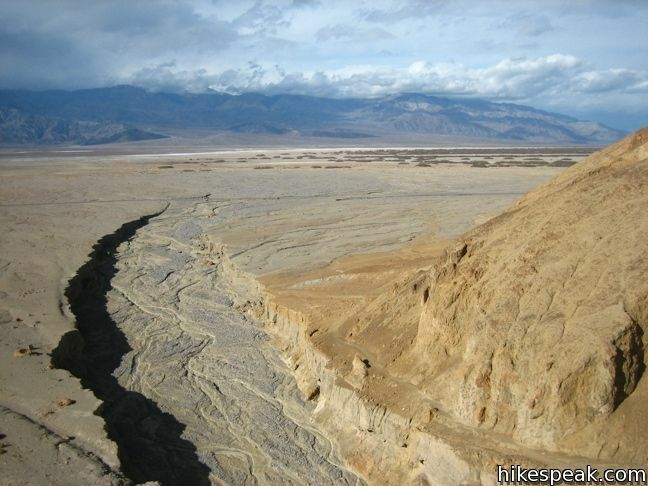 The gulch passes several Borax miles. 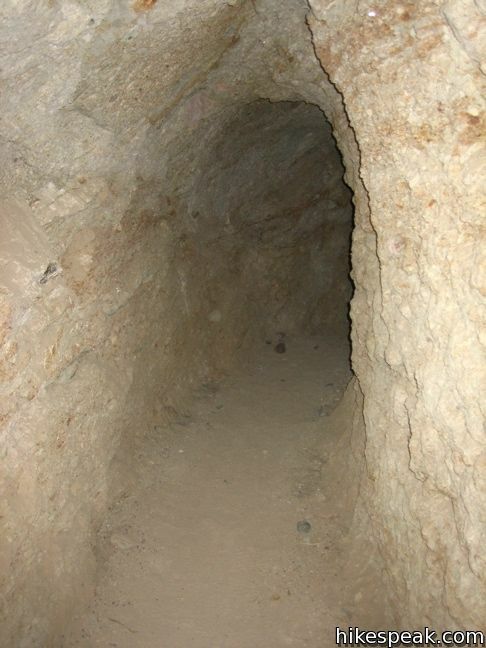 Borax, called white gold by miners, was extracted extensively in this region in the 1880s and many mines shafts remain. They are unstable and not for exploration. 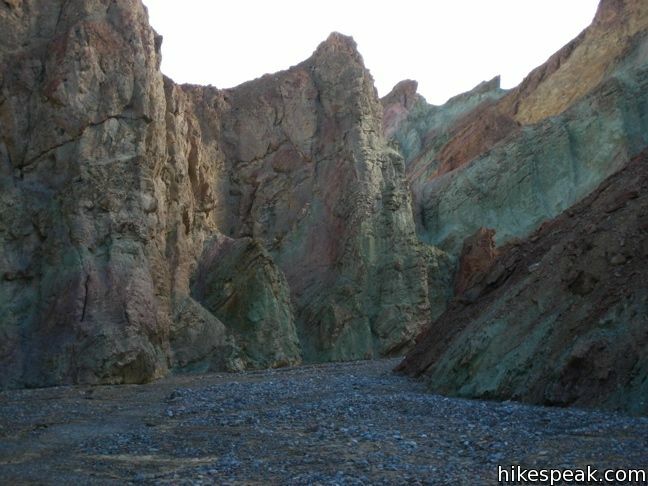 The bottom of Gower Gulch is home to a tall dry falls. To avoid this drop, follow the trail to the right. 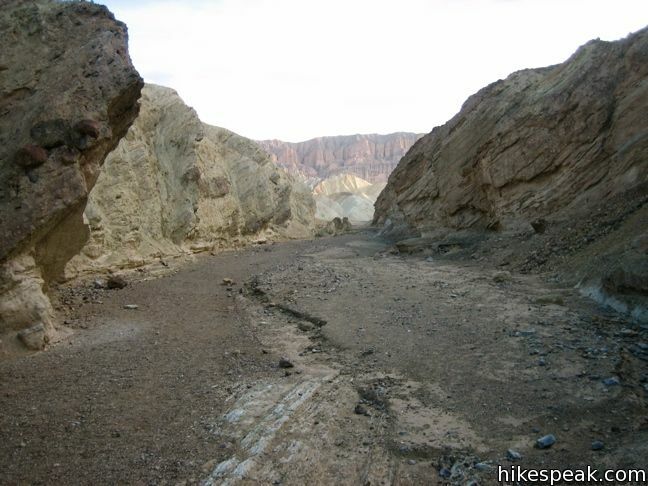 This route exits the canyon and turns right, crossing the open desert to the trailhead parking lot at the bottom of Golden Canyon. 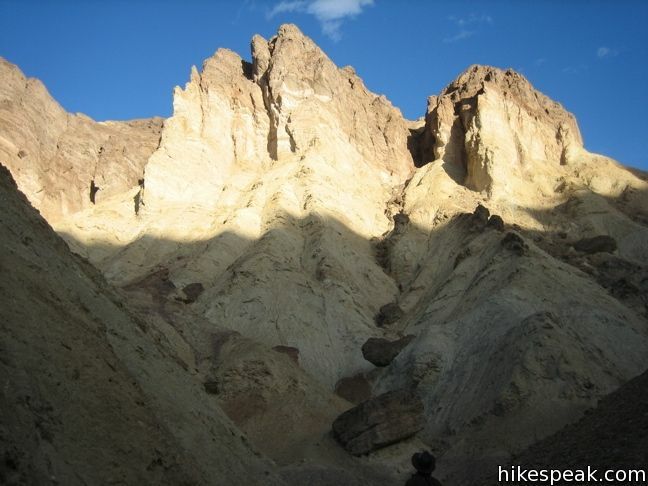 The Golden Canyon – Gower Gulch Loop is one of the more popular hikes in Death Valley National Park and is a true delight. Morning is the best time to hike the loop, when temperatures are cooler and the sunlight highlights the colorful landscape. 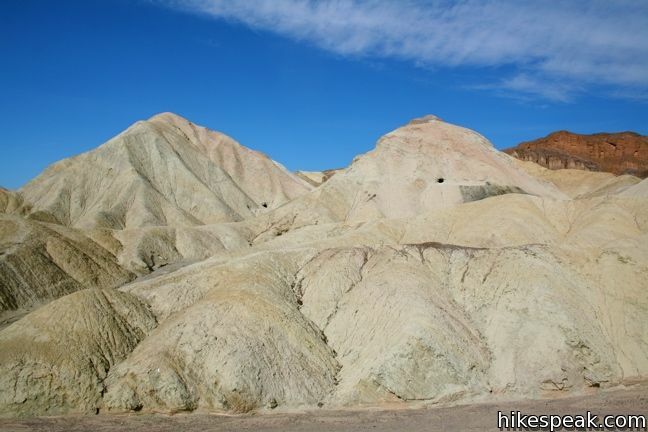 Review this NPS trail description and map before beginning the hike. 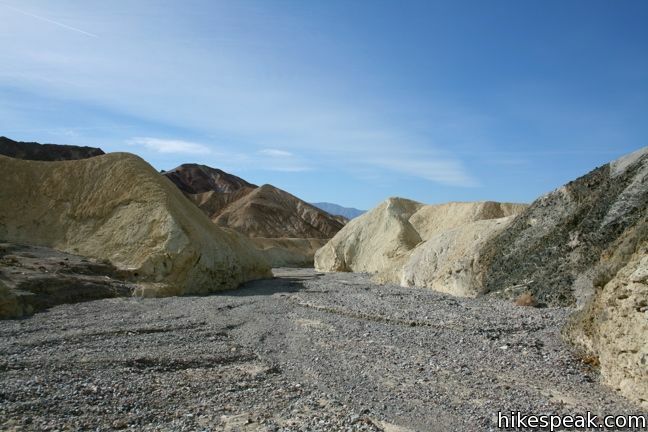 To get to the trailhead: From Furnace Creek, drive 2 miles south on Badwater Road and turn east (left) into the Golden Canyon parking area. My wife and I just did this hike last week. It was, indeed, quite wonderful but when we got to the dry fall, I couldn’t see where to continue (I could see the continuation of the trail across a small chasm but couldn’t see how to get to it). I’m sure I missed something obvious but does anyone have any pictures of that area that would point out what it is I missed? I hiked this in 2014 and was also confounded when I reached the falls. 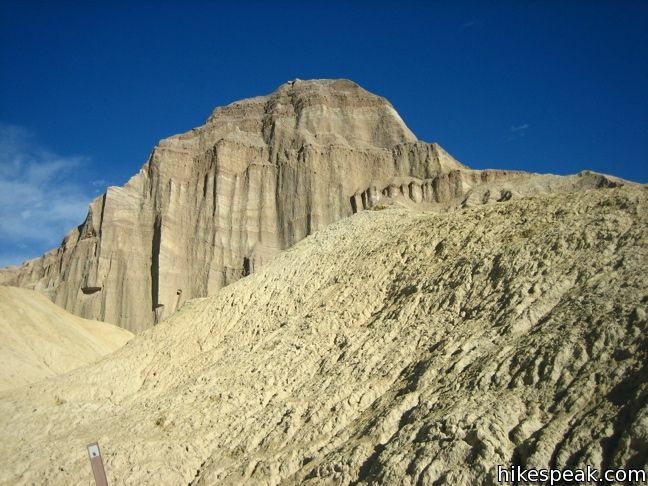 It was too late to go back around and had to climb to the skinny notch carved in the cliff. I was terrified as falling would be death. Just go slow and one step at a time. I’m not sure I’d do that again especially if the notch has degraded at all. Maybe check at the visitor center first. 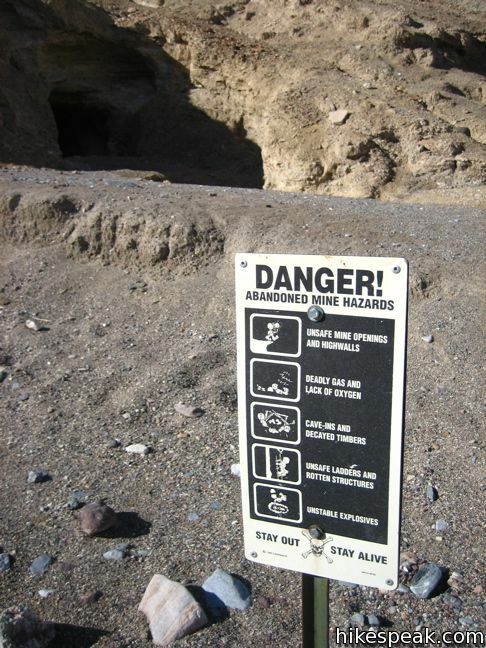 As the text notes above, “To avoid this drop, follow the trail to the right. 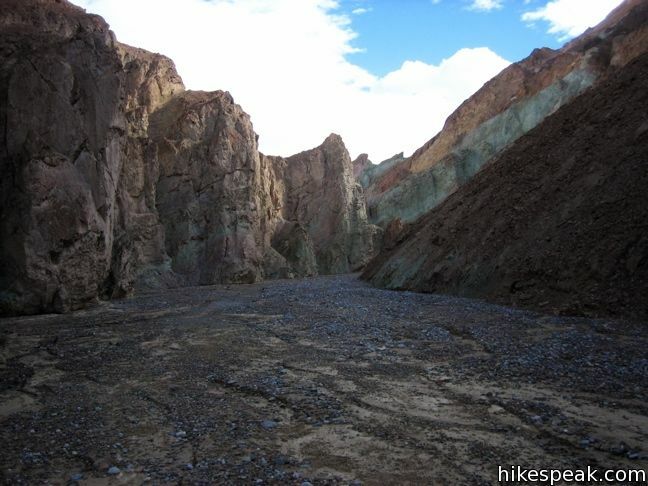 This route exits the canyon and turns right, crossing the open desert to the trailhead parking lot at the bottom of Golden Canyon.” When you come to the top of the falls, just walk to the right. 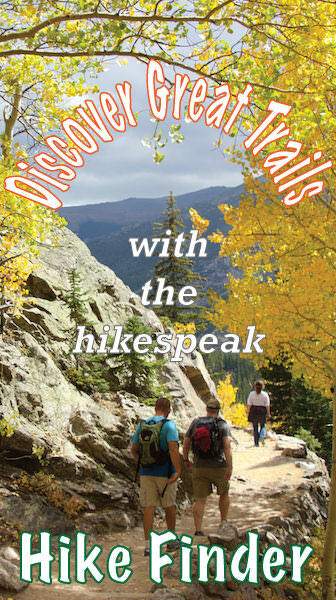 You will see the trail resumes, and you don’t have to retrace your steps or risk life and limb by climbing down the waterfall. My husband and I just hiked the loop for the first time this morning and loved it. We passed this segment without difficulty.